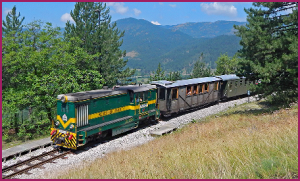 Explore very contrasting countries as we travel through regions of the Balkans. Slovenia is a country with many famous sights; Lake Bled, Postojna Caves, beautiful Adriatic coastline and the wonderful Lipizzaner white horses of the Vienna riding school, these are all included in our tour along with the fantastic lesser known locations of Ptuj and Catez; we also have visits to the Adria Motorhome factory and Rogaska Crystal workshops. Serbia is a complete unknown for most people but don’t expect to be disappointed by a visit or to feel unsafe, and do get there before too many others discover its charms. We mix the unspoilt nature of the Serbian Zasavica Reserve with the wonder of the Mokra Gora National Park along with discovering the old & modern history of vibrant Belgrade. Intermixed between Slovenia and Serbia are some specially selected stops in undiscovered parts of Hungary to give an alternative aspect of a visit to this fascinating country. Throughout the tour an above average number of group meals are included to enjoy the varied cuisine of all three countries. We meet at a campsite on the Italian Adriatic coast near to Trieste. This evening join with the Tour Directors and your fellow travellers for an informal drinks reception and tour briefing. A free day to explore along the coast; Piran a beautiful old town with stunning sea views is an easy bus ride away from our campsite. A full days sightseeing tour of Ljubljana. Our English speaking guide will assist us to get the most out of this lovely old city with a rich history and some fascinating architecture. Lunch is included in a city restaurant. 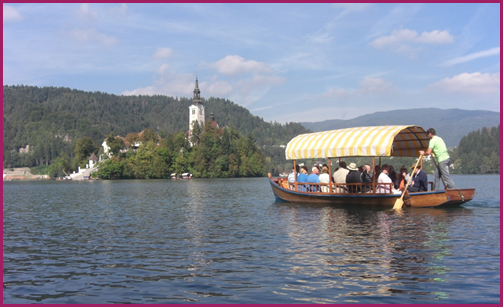 This morning we meet at the lakeside for coffee and a slice of the Lake Bled cake, then we are transported by the unique Pletna boats to the lakes island. Here everyone will have time to explore and visit the Church (entry fee payable locally) before re-joining the Pletna boats to be transported back to the campsite. A free day. There are lovely lakeside walks available directly from the campsite or simply relax in pleasant surroundings. A full day to enjoy all the spa and swimming pools attached to the campsite (some spa facilities may require an additional payment locally). This morning we take a leisurely walk into the old town to meet our local guide who will take us around the interesting streets, this will be followed by a light lunch. Later we visit Slovenia’s largest and oldest wine cellar. We will be given a guided tour of the cellars and visit the secure storage which are holding vintage wines from 1917, then tastings of a selection of wines. You will have the opportunity to purchase any number, which can be carried or taxied back to the campsite. A free day to relax around the campsite and thermal complex. A free day and opportunity to explore Baja, just a short walk from our campsite. Today we visit ‘Zasavica Reserve’. This is a phenomenon of nature’s beauty and a rare example of somewhere remaining to experience natural wetlands supporting a diversity of flora & fauna in an untouched environment. A free day to relax in rural surroundings. 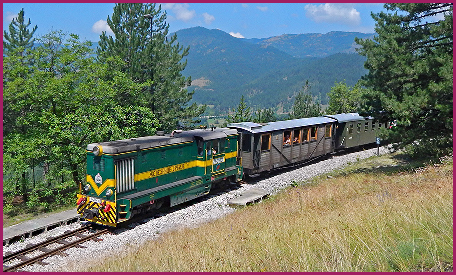 An excursion through the Mokra Gora National Park today, including taking a local narrow gauge railway journey. Lunch is in a local restaurant. A free day to explore the local surroundings, much of which is within walking distance. 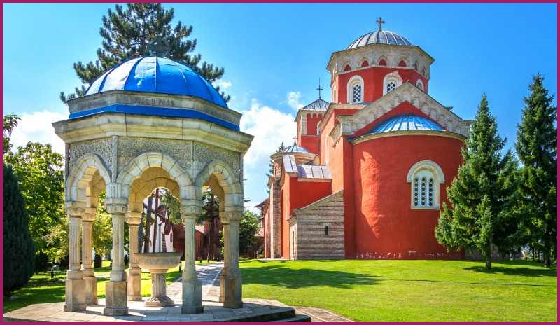 A full day excursion of Belgrade where Serbia’s old and new history will be discovered with the help of our local English speaking guide, including an insight into Marshal Tito’s life and leadership of Yugoslavia. Lunch is included in a city restaurant. 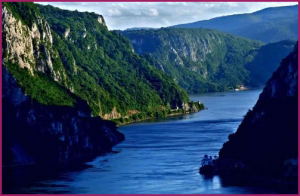 Another full day excursion, this time focussing on the river Danube and in particular the stunning area of the Djerdap National Park where the river dramatically narrows to pass through the Kazan Gorge. A light lunch is taken in a local restaurant. A free day to relax or return to Belgrade for further exploration and local shopping. There are easy bus links from nearby our campsite to the city centre. Our campsite is one of the best in Hungary, complete with a full complex of indoor and outdoor swimming pools. There are also a number of walking opportunities of all levels in and around the local woodlands surrounding the campsite. No need to get up early this morning to prepare breakfast as you’ll be treated to a traditional Hungarian Buffet Breakfast in the Ranch. After breakfast use the remainder of day to visit the stables, enjoy the surroundings and relax in preparation for tonight. This evening we meet in the ranches dining area for our Farewell Dinner of the ‘Kings Feast’ accompanied by local wines. 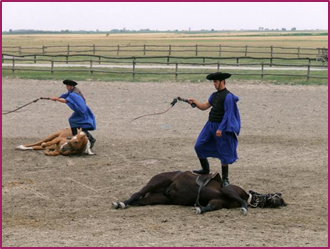 After our meal we move to the Ranch display arena for a spectacular show of horsemanship and bravery, and at the end of the evening it is no more than just a short stroll back to our motorhomes for the night. The tour ends this morning. If the Tour Directors are returning to Calais you may accompany them (at your own cost) on a route and timing of their choosing, or you may make your own way on from here. 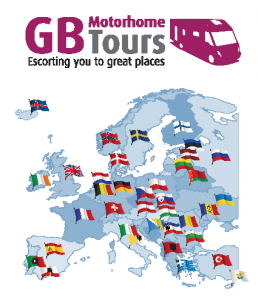 Seven additional camping nights with electric hook-up starting in Kent on Monday 11th May and followed by Belgium, Germany, Switzerland, 2 x Lake Garda in Italy and 1 additional night at Trieste.